"Pop, the whole country is mad over oil." Mabel Normand was one of the most popular comediennes of the silent screen, often being paired with such notables as Roscoe "Fatty" Arbuckle in the madcap "Fatty and Mabel" comedies for Mack Sennett at Keystone. She also had a solo starring career that extended into the 1920s, with The Extra Girl being one of the most notable and charming. Mabel stars as Sue Graham, a movie-smitten girl who enters a contest for a Hollywood screen test, appalled at her parents' suggestion that she marry stuffy druggist Aaron Applejohn (Vernon Dent) instead of her sweetheart, Dave Giddings (Ralph Graves). But Dave is also being pursued by a divorcee, Belle Brown (Mary Mason), who substitutes another photo for Sue's in her entry to make sure Sue is out of the picture (a setup pinched for Harold Lloyd's Movie Crazy (1932)). When Sue wins the contest, she finds that she's not as welcome in Hollywood as she would have liked, and her parents, encouraged by Sue's apparent good luck, sell the farm and come to visit her, and are promptly swindled out of their life savings, unless Sue can save the day. Normand is wonderful in this picture, charming and with an incredibly expressive face that requires no intertitles at all. She's particularly splendid in the scene of her screen test, in which everything that can go wrong does. The deadpan of Anna Hernandez as her skeptical mother makes for a great counterpoint that produces plenty of laughs. It's interesting to see a very young Vernon Dent here, long before he would become a regular foil of The Three Stooges. Cameos by director William Desmond and comic Billy Bevan help with the verisimilitude of the studio scene, and there's a ton of fascinating behind-the-scenes detail present. Director F. Richard Jones keeps the pacing brisk, with plenty of plot crammed into the rather brief 68m running time. There's even a startlingly effective suspense sequence near the end, complete with Expressionistic use of shadows and darkness to increase to nail-biting quotient. A brisk satire of silent serials is included, with a dog being dressed up as a lion in order to accommodate the brave hero. Of course, the actual lion gets loose thanks to Sue's ineptitude, allowing Normand to give free rein to her gift for intense physical comedy. The intercutting of this sequence is quite effective and makes it seem that Normand is in serious danger from the lion, though a close inspection indicates that it's almost entirely a trick of the splicing. The picture includes a number of scenes with a fairly modern sensibility, including a modestly risque sequence of a defiant Mabel in bed in a state of undress on what is supposed to be her wedding day. 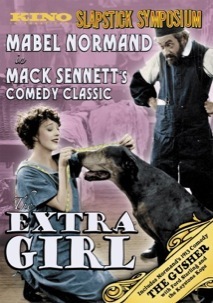 The humor holds up very well despite the passage of 85 years, and The Extra Girl would be a fine introduction to Normand or silent comedy generally. Image Transfer Review: The original full frame picture generally looks very good, with a fine greyscale. Some of the scenes seem a shade on the dupey side. The source print, from the Killiam collection, suffers from quite a few splices and jumps but otherwise it's quite acceptable, and without any significant damage besides the missing frames. Audio Transfer Review: The feature offers a theater organ score by Jack Ward that seems to date from 1969, judging by the copyright notices. The sound quality is stable though not particularly impressive, and seems a bit lacking in low bass. It's quite serviceable, however, and fits the scenes well without being overtly intrusive. Extras Review: The theme of an oil well scam is picked up in the bonus short, also starring Normand, The Gusher (1913). She and Ford Sterling are swindled by a fast talker who uses a salted oil well. Mabel gets top billing but not a lot to do as Sterling takes over the running time with an amazing number of heel kicks. It's rambunctious and more slapstick than the feature, and crams a lot into its 14m:02s running time. Ben Model contributes a solid piano score that highlights the physical comedy. It's a shame that more background on Normand and her career isn't offered, since she's frequently overlooked and underappreciated in assessments of silent comedy. Mabel Normand is at her best in this sparkling romantic comedy that has no dull moments. The bonus short is insubstantial in its own right, but it's certainly interesting to see the crude roots that Normand had to work with.